Toma meets the media in Abu Dubai. By the time Sergiu Toma got around to phoning his parents after winning just the UAE’s second-ever Olympic Games medal, it was late into the Brazilian night on August 9. With mum Iona and dad Nikolay in his native Moldova, it was the early hours of the morning. A lot has changed in the four years since the 29-year-old Toma competed under the banner of his homeland in London. In Rio he fought under the Emirati flag after becoming a naturalised citizen in the wake of the 2012 Games. He was a wanted man after beating Italy’s Matteo Marconcini in Rio’s Carioca Arena 2 to claim a bronze medal, conducting media interviews and going through the usual post-competition doping control tests. What was your favourite memories of the Rio 2016 Olympics? Let us know on social media, use #360fans on Twitter and Facebook. Eventually he managed to escape and share his joy with two people who couldn’t care less who he was fighting for, they were just parents proud of their son’s achievement. “It was my decision to change the country I represent and they respected that decision,” insisted Toma when speaking to media on his return to his adopted homeland. Toma done his nation proud in Rio. “They didn’t mind. If my home is here, why should they be angry about it. They were proud of my achievement. They are happy for their child. Aside from his medal, 2016 is already a milestone year for the Chisinau-born Toma. It marks 20 years since he was first encouraged to take up the sport by a friend of his father’s. “My father’s friend, when I was nine, proposed that I start,” he said. Although the Olympics is unquestionably the pinnacle for every athlete who featured in Rio, Toma admits a bronze at the 2011 World Championships in Paris had prepared him for the possibility of success in South America. “Previously, when I was a bronze medalist at the World Championships, it was unexpected and during the night I couldn’t sleep,” he recalled. Any athlete who dreams of reaching the top knows discipline and sacrifice is required. Now that his hard work has paid off, Toma admits he can bask in the hue of his bronze. “The main thing is I can sleep now, I can just enjoy myself. I can feel it and taste it,” he said. One thing he was perhaps even more grateful to taste after his triumph was treating himself to a meal more befitting an Olympic medalist than the strict and dull regime of kiwi and bananas he had become accustomed to. “Previously my dinner was one or two kiwis or one banana and three kiwis,” he recalled with a smile. Toma will relax for a few more weeks before heading back to the mat and planning his future. Although McDonalds and junk food may not be a part of his future, one thing definitely is – the 2020 Games. “In four years’ time I want to be on the pedestal at Tokyo 2020,” he said. #360debate: Is Bolt the greatest? Ruth Jebet won gold in the women's 3000m steeplechase. 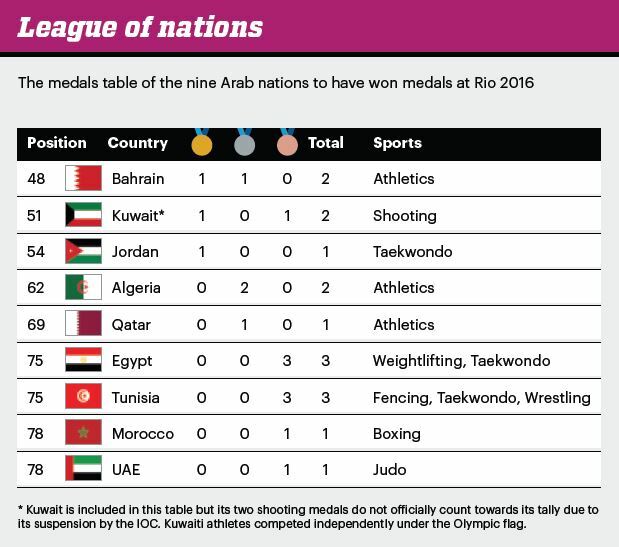 A total of 16 medals were won by Arab countries in Rio 2016 – although Kuwait’s two in shooting don’t officially count towards the nation’s tally due to its suspension by the International Olympic Committee (IOC) over government interference in sport. Those 16 were captured by athletes from nine Arab states – Bahrain, Kuwait, Jordan, Algeria, Qatar, Egypt, Tunisia, Morocco and the UAE – across eight different sports. Three of those are gold, four are silver and nine are bronze. Well it is more than the 12 (three gold, two silver, seven bronze) amassed in London four years ago, but it remains a measly tally collected by 22 Arab countries spread across the Middle East and North Africa. 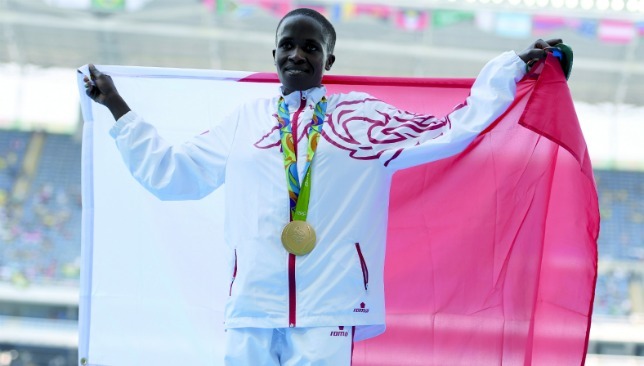 Bahrain was the highest Arab finisher in the Rio medals table, lying in 48th, thanks to the gold and silver won by Kenyan-born women Ruth Jebet in the 3,000m steeplechase and Eunice Jepkirui Kirwa in the marathon, respectively. 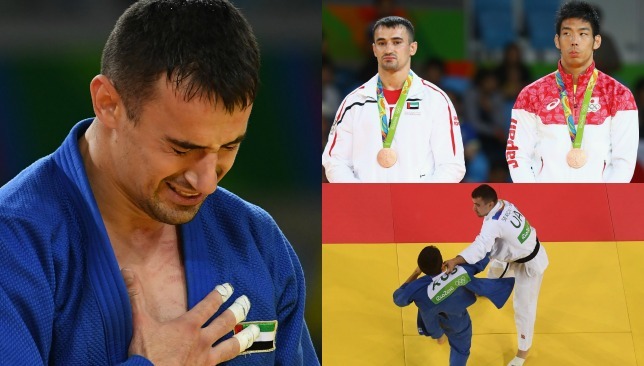 UAE’s Moldovan-born judoka Sergiu Toma was a third naturalised athlete bringing home a medal for an Arab country, getting bronze in the under-81kg category. 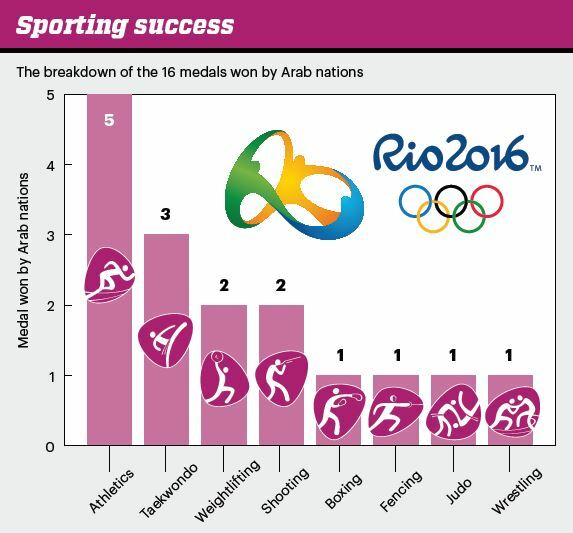 But while looking at numbers and figures can paint a depressing picture of how far behind the Arab world remains when it comes to sport, there is much to celebrate when it comes to Arab achievements in Rio this month. One important stat is that of the 16 medal won, six of them were won by women. For a region that does not always encourage women to take up sport, and with cultural barriers hindering female Arab talent, the fact that 37.5 per cent of the medals won were captured by women is a great achievement. Especially considering that only two Arab women brought home medals in London 2012. Two of Egypt’s three medalists were women, 18-year-old Sara Ahmed in weightlifting and 23-year-old Hedaya Malak in Taekwondo. Ahmed was the first Egyptian to ascend the Olympic podium in the nation’s 104-year history at the Games. Saudi Arabia, who up until London 2012 had never fielded any women at the Olympics, had four females competing in Rio – two in athletics, one judoka and one fencer. Perhaps the greatest progress was felt in the pool. Nada Al Bedwawi became the UAE’s first female swimmer at the Olympics and she was even chosen as the nation’s flag-bearer in the opening ceremony. There were nine Arab swimmers in the women’s 50m freestyle heats alone, from countries ranging from Palestine to Syria to Kuwait to Sudan. One unforgettable moment was when 18-year-old Syrian refugee Yusra Mardini, whose incredible story saw her steal the hearts of fans worldwide, won her 50m butterfly heat. Nada Meawad and Doaa Elghobashy made history as the first female beach volleyball pair from Egypt and they caught the eye of the public with their full-length bodysuits that showed every Arab woman that you can compete in sport without giving up your personal beliefs. History was not made at the hands of just the women of course. The sensational Ahmad Abughaush brought Jordan its first-ever Olympic medal by taking gold in taekwondo under-68kg action. Kuwait’s Fehaid Al Deehani, competing as an independent athlete, won his third career Olympic medal, and first gold, in double trap shooting, 16 years after getting bronze in Sydney. Mutaz Barshim won Qatar’s first-ever silver medal by clearing 2.36m to place second in high jump. While a lot of work needs to be done in order for Arab countries to give better performances at the Olympics, there is no doubt that what our athletes exhibited in Rio can be used to inspire many generations to come. It was a colourful close. Japanese prime minister Shinzo Abe was the surprise star of Tokyo 2020’s clever segment in the closing ceremony of the Rio Olympics on Sunday. While the colourful and loud party at the Maracana Stadium brought the curtain down on Rio’s Games, it also provided a glimpse of what the world can expect in four years’ time. In an 11-minute interlude that started with an a cappella rendition of Japan’s national anthem, Tokyo showed it was warming up for the Games with a video featuring Olympic athletes and computer game characters passing a red ball between one another. It ended up with Super Mario who jumped into a green pipe in Tokyo only for Abe to appear with the red ball, and Mario’s red hat, from the other end of the pipe in the Maracana. Acrobats and gymnasts in neon suits and illuminated frames then took over, in a routine that showcased Japan’s reputation for technological innovation. It looked slick and expensive, which are two words you could not often associate with Rio 2016, although it had plenty of energy and passion. Tokyo 2020’s handover show also worked better as a coherent spectacle than London’s effort in the Beijing closing ceremony, which featured dancers, a double-decker bus and David Beckham. Abe closed the segment by saying: “See you in Tokyo “, and seeing him so involved will have pleased an International Olympic Committee that is looking forward to a host city with fewer economic and political challenges than Rio presented. Tokyo 2020’s organisers have been careful to respect their predecessors, saying there is much they can learn from Rio, which is true, but much of that will be cautionary tales about the need to test venues and transport plans, and start selling tickets as soon as possible. Rio found all of that difficult, largely because of its economic problems, but Tokyo cannot afford to be complacent, particularly with a Rugby World Cup to prepare for, too, in 2019. Tokyo also have five more sports to accommodate, with baseball/softball, climbing, karate, roller sports and surfing joining the programme. And like most host cities, Tokyo is keen to use the Games as a catalyst for urban regeneration, which tends to add complexity to the plan. It will also have a problem the IOC avoided this time, by staging the Games in a southern hemisphere winter. Tokyo will be hot, and there are already some concerns that US television will want early finals for their prime time, which will only exacerbate that problem. But as Japan proved with its successful co-hosting of the 2002 World Cup, it is a dependable venue, and it has, of course, already staged an Olympics in 1964. The evidence from Rio also suggests that Japan’s athletes should win plenty of medals, which always makes a huge difference to the success of a Games. 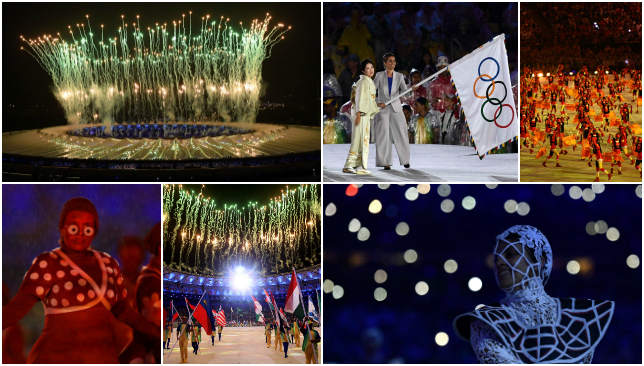 What was your favourite moment from this summer’s Olympic Games? Get in touch and let us know by commenting below, using #360fans on Twitter or getting in touch via Facebook. The ceremony was full of colour. It also included the final medal ceremonies. And a lot of dancing. It was a weird and wonderful nod to the Games. All remaining athletes took part. Before that dancing got back underway. Tokyo was handed the official baton. It paid tribute to video games. Something fully embraced by Prime Minister Shinzo Abe who dressed as Super Mario. While Rio said thank you to the world. All-in-all it was a spectacular ending.